Chinese manned spaceplane. Study 1988. 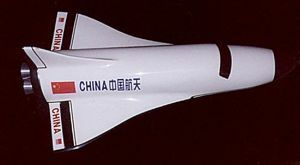 The Tian Jiao 1 (Pre-eminent in Space 1) manned spaceplane was proposed by the First Academy (now the China Academy of Launch Technology) in 1988. Status: Study 1988. Gross mass: 25,000 kg (55,000 lb). It duplicated the aerodynamic shape of the American shuttle, but at 16.5 m long and a wingspan of 12 m, had a launch mass of only 20 to 25 metric tons. 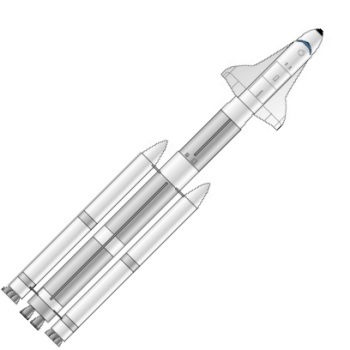 The spaceplane would be launched by an expendable booster. Pursuing this as a more modest first objective would allow China to take an incremental approach to eventually achieving a reusable shuttle. Conceived as being able to fly in both unmanned and manned modes, Tian Jiao 1 could have been available by 2003. Instead it was decided to pursue the Shenzhou ballistic manned space capsule in the short term, although development of spaceplanes of the Tian Jiao type continued in the 21st Century. Tian Jiao 1 mimicked the American shuttle planform, but used upturned wingtips for stability instead of the vertical stabilizer used on the shuttle. The spacecraft had a fuselage 4 m in diameter. No mass characteristics were available for the launch vehicle, which consisted of two liquid propellant boosters (each 33 m long and under 3 m in diameter) flanking a liquid oxygen/hydrogen powered core (4 m in diameter and 46 m long). Seventeen experts met in Harbin during 20-31 July, 1988, to make final assessments and recommend a course of action. It finally concluded that development of a winged reusable space shuttle system was acceptable as a national long-term goal to guide technology development But China did not have aerodynamic or rocket technology to develop a hypersonic aircraft with reusable rocket engines. The two designs that were considered technically achievable ranked very close in the expert's rating system - the Tian Jao 1 with a score of 83.69, and the Department 508 manned space capsule with a score of 84.00. However no decision could be made as to one or the other at the conference, and the debate raged further. The Tian Jao spaceplane advocates pointed out that the space capsule approach did little to advance the Project 863 objectives of leapfrogging Chinese technology to a world-class 21st Century level. Indeed China might even invite international contempt by flying a 1960's-type design. The report failed to impress the government. Chinese leader Deng Xiaoping rejected both plans, saying that neither could be flying in his lifetime. The Chinese space establishment went back to the drawing board. However within three years the plan for a manned capsule would be resurrected as Project 921, which would make its first manned flight in 2003 as the Shenzhou spacecraft. However basic technology work on a Chinese manned spaceplane continued. The first model of a planned manned shuttle was exhibited at Hanover Expo 2000. This showed a double-delta winged spaceplane with a single vertical stabilizer, equipped with three high-expansion engines. Based on the size of the presumed two crew side-by-side cockpit, dimensions could be very roughly estimated as a wingspan of 8 m and a length of 12 m, and a total mass of 12 metric tons. This seemed about half the size but the same configuration as the original six-engined Tian Jiao orbiter designed in 1988. Any Chinese shuttle project would probably be realized in a different form than that originally planned some time in the first half of the next century. The Hanover model suggests that a modest spaceplane, launched by expendable boosters, would be flown before proceeding to any full-scale reusable winged launch vehicles. By 2002 Chinese space scientists were speaking of a two-stage to orbit, ballistic recoverable transport as the first recoverable Chinese space vehicle. The decisions by Russia and America in 2004 to abandon winged designs for the next generation of manned spacecraft and stick to manned capsules may mean that China would abandon any plans for a similar design. Family: Chinese Manned Spacecraft, Spaceplane. Country: China. Agency: CALT. 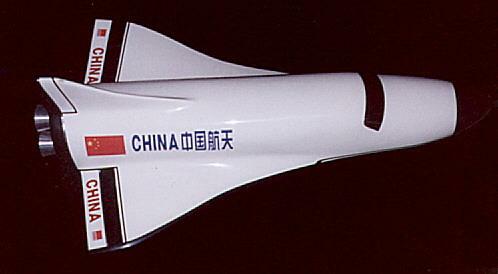 Chinese shuttle craft - model at the Chinese Pavilion, Hannover Expo 2000.The model indicates a spaceplane similar to the cancelled European Hermes.